LordMustang wrote: I'm trying to get some building models from AC:U, but whenever I click on a mesh it just crashes. Unfortunately this is a very common problem. I have the same problem with me. Unfortunately, I don't think it's a cure. We're just unlucky. The only way you can see this way is by exporting models. That's a shame, because I don't think Unity updated in any way. If it worked before it means that an update to Archive Next could have broken it. How do I export Hair Meshes? They don’t seem to display anything in the program, and exported .OBJs do not seem to display anything either…? Quoting myself to apologise for asking a question I had not properly researched if an answer existed for. I understand now how to export the .ARX files of the hair meshes, and open these in 3ds max. However, how I get usefull geometry (akin to what we see here, or on the picture postet by RunaWhite on page 18) out of these files still illudes me. If anyone is able to help me out, I would be very grateful. Also, still looking through the files again and again for that one damn Cutlass model . I extruded those outlines in Blender, entering Edit Mode with all vertices selected, pressed E and resized a bit to add some volume, then switched back to Object Mode. I did that process with every hair mesh extracted from the files (Lod0,1,2). I also had to duplicate parts (at least for Arno and Elise from Unity) because that way the hair appeared way too empty and not even close to the original one. I had to do the same with Syndicate even if the meshes are better sorted there. Last edited by RunaWhite on Sun Jan 13, 2019 1:07 pm, edited 1 time in total. I extruded those outlines in Blender, entering Edit Mode with all vertices selected, pressed E and resized a bit to add some volume, then switched back to Objec Mode. I did that process with every hair mesh extracted from the files (Lod0,1,2). Hello, are older version of "ForgeX" still available to download somewhere? I read that it apparently had support for Shaun White Skateboarding, and that's the game files i'm interested in, while ARchive_neXt doesn't support this game. 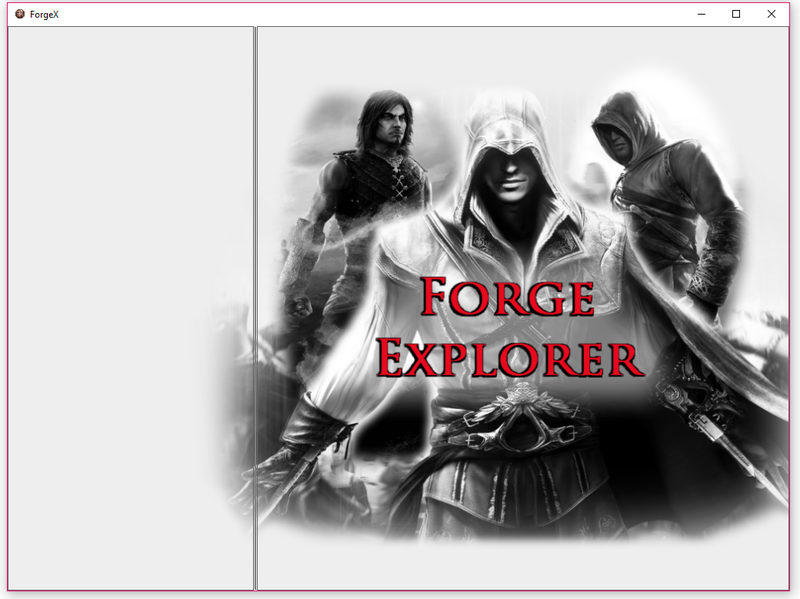 I tried reading the files anyway with another game profile, Prince of persia 2008 is the one that allows me to see the most of the folders tree, but I can't read or preview any textures / models. Larxian wrote: Hello, are older version of "ForgeX" still available to download somewhere? I read that it apparently had support for Shaun White Skateboarding, and that's the game files i'm interested in, while ARchive_neXt doesn't support this game. I tried reading the files anyway with another game profile, Prince of persia 2008 is the one that allows me to see the most of the folders tree, but I can't read or preview any textures / models. Weird, usually the new versions should carry over the previous support. I wonder if it actually worked before? I'm afraid the older versions of the program have all been replaced by the new update each time. RunaWhite wrote: Weird, usually the new versions should carry over the previous support. I wonder if it actually worked before? I also actually talked to someone from the "The Brotherhood of the Realm" page on facebook, who told me that the support was drop because the author didn't own shaun white and couldn't test it anymore apparently. The older version from what I've been told aren't available anymore and never got support past windows XP. I wonder if it just wouldn't work at all on W10 or if it could kinda work, would still be curious to try it if anyone still have this older version. However it does seem like it doesn't work properly indeed, at least on Windows 10. I get a "Microsoft.NET Framework" warning when I open it, I can still open it but there aren't any menus or options visible. Anyone have any idea on how to convert the AC Origins textures? There is a problem with the registry. So the program registry is unreachable. If the program is run as an administrator, the problem does not occur. Maybe you can try changing the compatibility mode. I tried it but I can't say it was hardly effective. Still same. zerozone wrote: Anyone have any idea on how to convert the AC Origins textures? create a new thread in "Graphic file formats" section and upload some samples. Hi all, is this app still working? Because everytime i try to view a mesh i'm getting 'Error Viewing Mesh' error. I got directx runtime and 4.5 NET Framework installed. I know i can still export the meshes but it doesn't help. I need to see what i'm exporting. Any help with that? @MichaelDarkAngel Could you please share the Ghost Recon Wildlands file format？Thanks.